The MESH (Mapping European Seabed Habitats) project aimed to promote harmonised production and use of marine habitat maps covering the North Western European seas by adapting and enhancing previous achievements in this area. It involved the collation of habitat mapping information across several countries, including Belgium, France, Ireland, Netherlands, UK as well as acquisition of new data in MPAs in each country. The MESH Project developed an interactive Survey Scoping Tool designed to be used for each element of a mapping programme (broad, intermediate and fine scale) an will assist in the compilation of a full Scoping Report. What tools are available for a particular survey based on its purpose, objectives and type of information required? What are the different types of survey strategy available? The increased need for management of marine resources creates a substantial demand for intertidal and subtidal seabed habitat maps. This demand has been met by numerous seabed mapping and sampling studies in recent years, mostly in relation to specific development proposals, licence applications or the designation of protected areas. The lack of co-ordination between studies or an agreed standard survey process has resulted in inconsistent data at a sea basin scale. 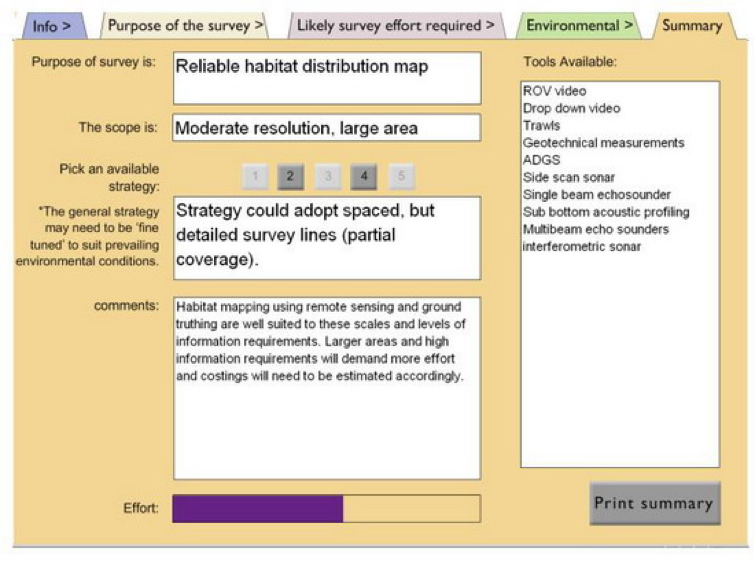 To combat this the MESH project developed a set of internationally agreed standards and protocols for habitat mapping in addition to a set of tools, including the survey scoping tool which is designed to assists the survey planning stage to help assure a project can deliver a final map with the desired confidence rating. One such tool was the MESH Scoping tool which is delivered as an interactive Flash ® animation designed to be used to each element within a mapping programme and assist in the compilation of a Scoping Report. 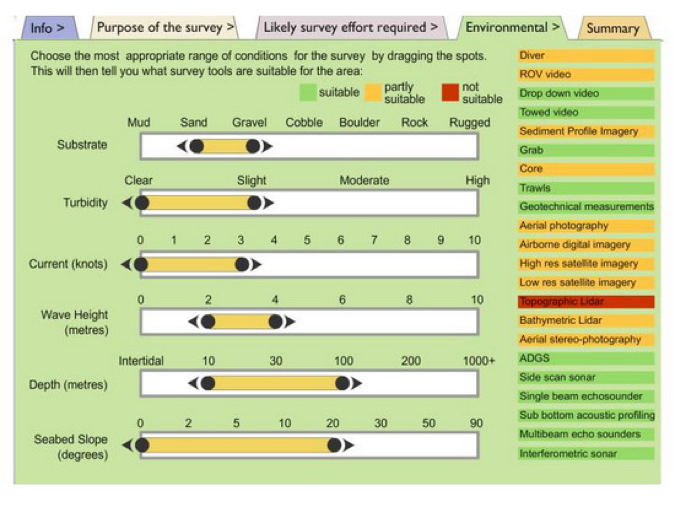 The scoping tool can broadly be divided into three sections, designed to explore the overall scope and purpose of the survey; the likely effort that will be required to complete this task and finally a requirement to take into consideration the environmental conditions which are likely to be encountered when undertaking the survey. 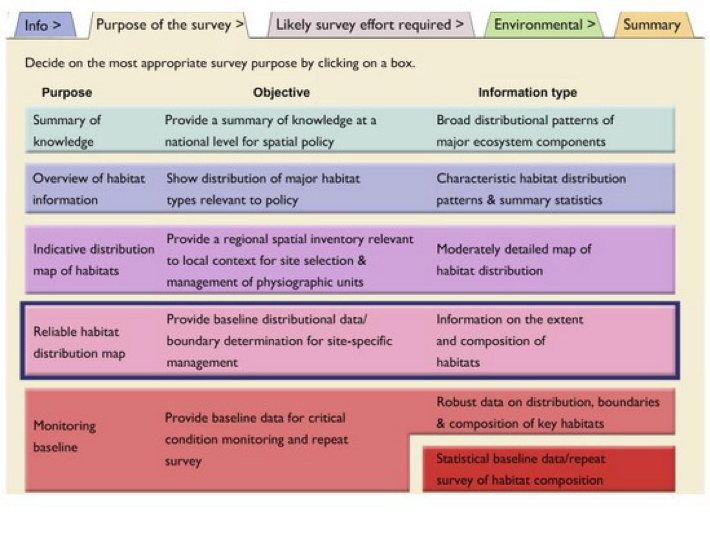 The second section of the tool considers criteria about the mapping exercise that affect the likely survey effort required. Potential mismatches and the likely level of effort required to complete the survey are also indicated. The third section in the tool asks you to consider the environmental and other conditions likely to be met during the survey. Adjusting the slide bars will show how these conditions are likely to affect the suitability of a range of survey tools and techniques. The main output of the tool provides a printable summary of all choices made with regarding to the scope and purpose of the survey. Tools / equipment that would be useful in conducting the survey are listed along with helpful summary comments. The tool is not intended to provide a definitive answer, but to help users consider the scope of the mapping programme and what can be realistically achieved within each of the broad, intermediate and fine scale elements. Whilst this tool was produced by funding from a North-West European funded project it could be used in any sea basin.